Optical rotation: +8° to +9° (c = 5, 1 N HCl, 20°C). Stability Stable, but may be air sensitive. Incompatible with oxidizing agents, bases. L-Cysteine is one of the 20 natural amino acids and, besides methionine,the only one which contains sulfur. It is a thiol-containing non-essential amino acid that is oxidized to form Cystine. It is a non-essential sulfur-containing amino acid in humans, related to cystine, Cysteine is important for protein synthesis, detoxification, and diverse metabolic functions. Found in beta-keratin, the main protein in nails, skin, and hair, Cysteine is important in collagen production, as well as skin elasticity and texture. Also required in the manufacture of amino acid taurine, Cysteine is a component of the antioxidant glutathione, and plays a role in the metabolism of essential biochemicals such as coenzyme A, heparin, and biotin. L-cysteine hydrochloride is used in the baking industry as dough conditioner. Specially, it breaks the disulfide bonds of gluten, which lowers the viscosity of the dough. It is then easier to work with and increases the elasticity of the dough, helping it to rise during baking. L-cysteine is available through many dietary sources, primarily animal protein. Eggs and dairy products also contain significant levels of l-cysteine. Vegetable sources of l-cysteine include broccoli, Brussels sprouts, garlic, granola, sprouted lentils, oats, onions and peppers. The commercial extraction of l-cysteine typically uses human hair, due to its high concentration of this amino acid. Other commercial sources include hog hair and poultry feathers. L-cysteine may also be synthesized in a process that involves fermentation by a variety of E. coli. L-cysteine (chemical name, 2-amino-3-mercaptopropionic acid or mercapto alanine) is a mercapto-containing aliphatic neutral amino acid. It is colorless crystal with isoelectric point of 5.07, PK1 = 1.71, pK2 = 8.33, and pK3 = 10.78. It is Soluble in water, ethanol, acetic acid and ammonia, while not soluble in benzene, carbon tetrachloride, ethyl acetate, carbon disulfide, ether and acetone. L-cysteine is an essential component of the protein and can be synthesized from serine or methionine in animals. L-cysteine comes to decompose while heated to 240 ° C, and can be quickly oxidized by air to form cystine in neutral or slightly alkaline solution. The acid solution of L-cysteine can be stored for several days, and stored better under the protection of nitrogen. The aqueous solution of levorotatory L-cysteine changes into dark blue after adding ferric chloride. It can be produced by the degradation of cystine, and also can be obtained by the hydrochloric acid hydrolysis, copper oxide treatment and then hydrogen sulfide decomposition of human hair and other silkworm. L-cysteine can be used for anti-radiation and the treatment of radiation sickness, as well as for hepatitis, liver poisoning, radiopharmaceutical poisoning, acrylonitrile and antimony poisoning and allergic diseases in medicine. It can also be applied for the biochemical and nutritional research. Pyruvate and mercaptoethanamine are its general catabolites. It is involved in the synthesis of glutathione, taurine and so on. The disulfide bridge in the polypeptide chain is also formed by dehydrogenation and condensation of two molecules of cysteine. L-cysteine, also known as cysteine, is a non-essential amino acid of the human body. Amino acids are protein components and protein is the material basis of life. Ranging from human to microorganism, all consist of protein. Protein is composed of peptides, and peptide chain is composed of amino acids. Different proteins are composed of peptide chains in different order and length. Genes related to heredity are in fact amino acid chains in different orders. L-cysteine is closely related to cysteine, and two molecules of cysteine can form a cysteine. Cysteine is relatively unstable and easy to become cysteine. Cystine can also re-generate cysteine. These two both are sulfur-containing amino acids, which affect the formation of skin and can be used for detoxification. 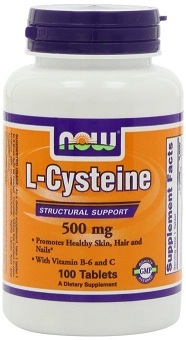 L-cysteine is present in keratin, which is the major protein that makes up nails, toenails, skin and hair. L-cysteine can help the production of collagen, and can maintain the skin's elasticity and texture. It is also related to the protein of digestive enzymes, and cysteine can supply –SH group to many important enzymes, such as succinate dehydrogenase and lactate dehydrogenase. L-cysteine is mainly used in the field of cosmetics, medicine and food. In cosmetics, it can be used for the preparation of perm essence, sunscreen, hair-restoring perfume and other nourishing hair essence. In the field of medicine, it is mainly used for the preparation of methyl cysteine, ethyl cysteine, acetyl cysteine, cysteine methyl ester, cysteine ethyl ester as well as comprehensive amino acid preparations and other drugs. Cysteine can be used as protective agent for radiation damage. In food, L-cysteine can be used as bread fermentation aid (ripening agent), stabilizer of milk powder and fruit juice antioxidants and nutrition of pet food and so on. The above information is edited by andy of Chemicalbook. L-cysteine is an important precursor for antioxidants such as glutathione – a product metabolized in the liver. Glutathione is essential for the breakdown of toxins in the body, such as alcohol. L-cysteine is also the precursor for other important antioxidants that help ward off cancer by decreasing the incidence of cell mutation. Cancer is caused by the replication of genetic mistakes (mutations) that go unnoticed by the cell’s recognition system. In healthy cells, mutations are caught and denatured before replication continues. If mutations are not caught, then the on/off mechanisms that monitor cell formation may be disrupted allowing uncontrolled proliferation of cells into tumors. A healthy cell rich in amino acids such as L-cysteine, has a better chance of sensing and discarding such mutations. L-cysteine benefits can also include improved heart and circulatory system health. Inflammation plays a key role in heart health. The inflammation response causes a cascade of events to bring fluids, proteins and cells to damaged tissues. Some of these substances carried in an inflammatory response are sticky and can get stuck on the walls of arteries. The presence of L-cysteine has been found to directly regulate this adhesion of sticky substances to the walls of arteries and therefore has a positive effect on the health of our hearts. L-cysteine can be used as bread improver, nutritional supplements, antioxidants and color fixative. It can also be applied for curing acrylonitrile and aromatic acid poisoning, preventing radiation damage and treating bronchitis and phlegm. L-cysteine can absorb alcohol and convert it into acetaldehyde to alleviate a hangover. L-cysteine can be used for biochemical research and as the antidote for hepatitis, liver poisoning, radiopharmaceutical poisoning, antimony poisoning, etc. L-cysteine is mainly used for medicine, cosmetics, biochemical research and so on. It can be used in the bread material to accelerate the formation of gluten and to promote fermenting and depanning, as well as to prevent aging. It can be used in natural fruit juices to prevent oxidation of vitamin C and to prevent fruit juice from becoming brown. The product has detoxification effect and can be used for curing acrylonitrile poisoning and aromatic acidosis. This product also has the role of preventing the human body from radiation damage. It can be used as bronchitis drugs, especially as phlegm drugs (mostly in the form of acetyl L-cysteine methyl ester salt). In cosmetics, it is mainly used as cosmetic water, perm solution, anti-sun cream and other skin care. L-cysteine can be used as the receptor agonists of NMDA glutamate. Cysteine is a sulfur-containing amino acid that constitutes protein. It has an ionized mercapto side chain and is hydrophobic. However, it is unstable in neutral pH or alkaline pH in the air, and its aqueous solution can automatically convert into cysteine . Although cystine does not belong to the list of amino acids composing protein, but in the process of protein conformation, it can generate by oxidizing the SH group of two close cysteine, so many protein molecules in the body contain cystine. The formation of cystine disulfide bond makes the protein conformation more stable. Of course, if the cystine is reduced, it can also produce two molecules of cysteine. The importance of cysteine as a protein component is to give the active protein a free SH group, for example, the active centers of some proteases (papain, bromelain) and glyceraldehyde phosphate dehydrogenase all regard SH group as their function base. The metabolic pathway of cysteine carbon skeleton is mainly to form pyruvate and generate oxaloacetate through carboxylation for gluconeogenesis, so cysteine belongs to the glucogenic amino acid, or to change into acetyl-CoA and come into the tricarboxylic acid cycle for complete oxidization. There may be three ways for cysteine transforming into pyruvate. Non-protein nitrogenous compounds synthesized or part-synthesized by cysteine include taurine, peroxydihydroxyethylamine, coenzyme A and glutathione. 1. Tin granule reduction method. Dissolve cystine in dilute hydrochloric acid and filtrate. Add tin granules into the filtrate and heat for reflux of 2h. Dilute the reducing solution with water and remove the residual tin particles. Saturate the diluted solution with hydrogen sulfide and filtrate. Wash the residue with a small amount of water and combine the washing liquor with filtrate. Then concentrate the mixture under reduced pressure, cool for crystallization, filtrate and dry to obtain L-cysteine hydrochloride. 2. Electrolysis reduction method. Add distilled water, hydrochloric acid, cystine into the electrolytic tank and dissolve under stirring. Maintain at 50℃ until the electrolysis to the end. Add hydrogen sulphide to pass through the resultant electrolytic solution for several hours and filtrate. Decolorize the filtrate with activated carbon, filtrate and concentrate under reduced pressure. Cool for crystallization, filtrate and then dry to give L-cysteine hydrochloride. 3. Use L-cysteine hydrochloride as raw materials. Neutralize L-cysteine hydrochloride with alkali and obtain L-cysteine after further purification. 4. Heat the hair (or animal hair, feathers) with hydrochloric acid for 6~8h and then hydrolyze. Remove the hydrochloric acid by vacuum distillation. Add activated carbon for decolorization, Filtrate and neutralize with ammonia to obtain L-cystine crude crystals. And then dissolve with ammonia solution for recrystallization. Next dissolve with hydrochloric acid again and perform electrolytic reduction. The resultant electrolytic solution is concentrated, cooled for crystallization and dried to obtain the product. 2, synthesis method: the current industrial applications include β-chloroalanine method, α-bromo-methyl acrylate and Degussa method. Use α-chloroacrylic acid methyl ester and thiourea as raw materials to firstly synthesize DL-2-aminothiazoline-4-carboxylic acid and then carry out asymmetric hydrolysis under the action of Pseudomonas aeruginosa enzyme to obtain the product. Use methyl α-bromo-acrylic acid as raw materials to react with methyl thioacetamide and form 2-methyl-thiazoline-4-carboxylic acid methyl ester. The product can be obtained after further hydrolysis. α-methyl bromoacrylate method: use chloroacetaldehyde as raw materials to react with sodium bisulfate and form α-hydroxy-β-chloro ethanol sodium sulfonate . and ammonium hydroxide react to form α-amino-β-chlorosulfonate . and sodium hydride react to obtain α-amino-β-chloropropionitrile. After the hydrolysis of , β-chloroalanine  is generated. Then  and ammonium thiosulfate react and hydrolyze to form DL-cysteine precipitation. And L-cysteine can be finally obtained after further desalination. 3, enzymatic method (Ajinomoto method): use α-chloro acrylic acid methyl ester and thiourea as raw materials to firstly synthesize DL-2-aminothiazoline-4-carboxylic acid (DL-ATC). L-cysteine is produced by the asymmetric hydrolysis of DL-ATC in the presence of the three enzymes of thermophilic thiazole pseudomonas bacteria. Cysteine can help the detoxification of the body. It is the best free radical scavenger combined with selenium and vitamin E. Cysteine is also the precursor of glutathione, which is capable of binding with poisonous substances for detoxication in the liver. It can protect the liver and brain from the damage of cigarettes, alcohol and drugs. Since cysteine is more soluble than cystine, it is easier for cysteine to be used by the body to treat various diseases. Vitamin B6 is required for in vivo cysteine synthesis. Cysteine can not be synthesized in the presence of chronic conditions, so people with chronic diseases need a higher dose of cysteine, for example, 3 times a day for 1 month. The patients with rheumatoid arthritis, vascular sclerosis or cancer need to supplement cysteine. Cysteine can also assists people to accelerate recovery after surgery and burns. It can form complexes with heavy metals, and enhance iron absorption. These two amino acids can also accelerate the use of fat and formation of muscle. Cysteine can clears mucus in the respiratory tract, so it can treat bronchitis, emphysema and tuberculosis. Cysteine (or acetyl-linked acetylcysteine) can be used to prevent the side effects in cancer chemotherapy or radiation therapy. It can also increase the level of glutathione in lung, kidney, liver and bone marrow, so it has anti-aging effects, for example, it can reduce the incidence of age spots. Cysteine can inactivates insulin. Therefore, patients with diabetes can not take cysteine. Genetic cystinuria can result in cystine stones, so people with genetic cystinuria can not take these two amino acids. L-Cysteine is a non-essential amino acid that can be synthesized by the human body under normal physiological conditions if a sufficient quantity of methionine is available. L-Cysteine is commonly use d as a precursor in the food and pharmaceutical industries. L-Cysteine is used as a processing aid for baking, as an additive in cigarettes, as well as in the preparation of meat flavours. cysteine is an essential amino acid obtained by fermentation. Cysteine is a component of the skin’s natural moisturizing factor and can help normalize oil gland secretion because of its sulfur content. It is also said to promote wound healing. In addition, studies indicate that cysteine helps increase levels of glutathione (an anti-oxidant) in the body. It is considered beneficial in treating oily skin. Cysteine is a nonessential amino acid that functions as a nutrient and dietary supplement. It is used in foods to prevent oxygen from destroying vitamin c and is used in doughs to reduce mixing time. ChEBI: An optically active form of cysteine having L-configuration. Moderately toxic by ingestion, intraperitoneal, and subcutaneous routes. Experimental reproductive effects. Human mutation data reported. When heated to decomposition fumes of SO and NO.